Presenting the Amazing collection of stickers pack for whatsapp for your Special timepass Chat with Friends and express your feeling funny style with cretivities. Presenting the Amazing collection of stickers pack for whatsapp for your Special timepass Chat with Friends and express your feeling funny style with cretivities. 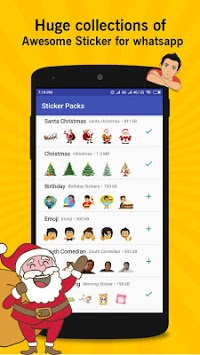 Download Sticker Pack For Whatsapp - wastickerapps, here various categories stickers like Christmas Stickers, Good Stickers, Birthday Stickers, Emojis Stickers, Love Stickers with Hearts, Roses and Teddy Bears and share using any of your favourite application like whatsapp, facebook, Telegram, Instagram, hike, wechat etc. Almost all type of Sticker pack are added in the single app. * One tap easy sharing with a sticker for WhatsApp. * Best collection of happy, sad, curious, angry, surprise, Birthdayfunny stickers for Whatsapp. * HD quality Smileys and Traffic stickers for your expressions. 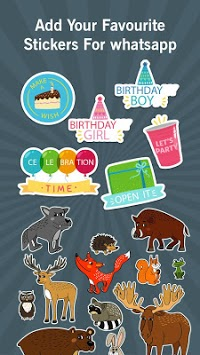 * Wonderful categories of Funny stickers according to mood and Occasion. * Character stickers for different mood/feelings. * Fascinating collection of Funny sticker on single platform. Download this free android application Sticker For Whatsapp and enjoy your Funniest Chatting with Sticker For Whatsapp - wastickerapps !! 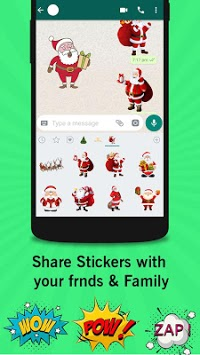 IMPORTANT : The "WhatsApp" name is copyright to WhatsApp, Inc. Stickers for Whatsapp - WAStickers is in no way affiliated with, sponsored or endorsed by WhatsApp, Inc. If you notice that any content in our app violates any copyrights than please inform us so that we remove that content.